It’s hard to miss the financial press’ recent headlines about the inverted yield curve, which – if the press if right - inevitably signals our next recession. This news drove the stock market down 1.9% on the day the curve first inverted as if the recession would be upon us within the week. The yield curve is a line plotting out the interest rate (yield), which is paid to investors across maturities, from three months to 30 years. In a “normal” environment, longer maturity bonds provide yields higher than shorter maturity bonds. 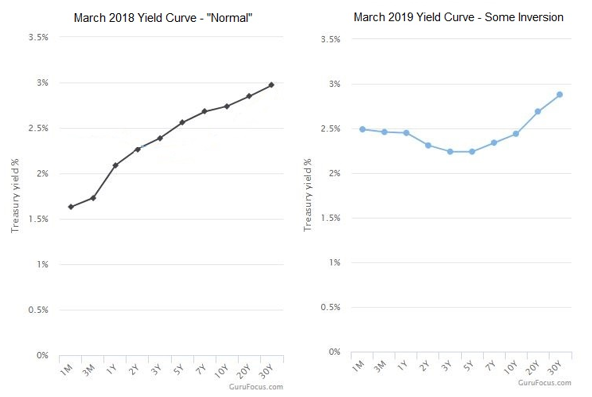 The yield curve in March of 2018 (chart on left, below) shows this clearly as three-month Treasuries were yielding 1.73% and 5-year Treasuries were yielding 2.56%. An inversion happens whenever the shorter maturity bonds provide yields higher than longer-term ones—which is counterintuitive since the risks of holding bonds longer-term are greater than if you’re parking your money for a few months. Currently, we can see an inversion of the yield curve (chart on the right, below) as three-month Treasuries are yielding 2.46% while 5-year Treasuries are yielding 2.24%. So, what’s the big deal? Well, it turns out that yield curve inversions have occurred before every one of the last seven recessions. For many investors, this is their biggest indicator of recession risk. Given the financial media’s history of blowing things out of proportion, I went to the original source of this indicator, Duke Professor Campbell Harvey, to discover what his research really tells us. In the 1980s, it was widely believed by investors that stock market declines signaled recessions. Professor Harvey’s research challenged this theory. In his 1986 University of Chicago dissertation, he showed that the slope of the yield curve was a much better recession predictor, and many have been watching yield curves ever since. Since Professor Harvey’s research was published, there have been four recessions, and the yield curve has inverted before each one. What’s even more impressive is the fact that his indicator has generated no false signals since his work was published. Does this mean it is time to sell all stocks and move to the hills? The press has been looking for any inversion on the yield curve. The professor’s research focused on three-month and 5-year yields; Professor Harvey does not worry if (say) the 2-year yields more than the 10-year. One day does not make an inversion. Professor Harvey’s work declares a signal only after the yield curve is inverted for three months. We don’t know how long the curve will remain inverted. The indicator (once triggered) has historically led the recession by 12 to 18 months. There is no precise timing here, but the indicator tells us we have time. Professor Harvey does not rely solely on this indicator; he believes multiple data points are necessary. The professor watches three other key recession indicators: market volatility, anti-growth protectionism, and CFO recession predictions. Does it ever make sense to sell all stocks and move to the hills? The year before a recession has seen positive performance 67% of the time with average returns of +5.4%. Performance after recessions (1, 3 and 5-years out) has been above average with returns averaging 15.3%, 11.9%, and 12.3% respectively. Despite the headlines, we have no more insight into the future of the stock market than we did before the recent yield curve changes. We might experience a recession this year, or next or in 2022 and that recession may see lower or higher stock market pricing. Although I’m cautious about near term stock market returns, I won’t be packing my bags anytime soon. is a Registered Investment Advisor.